Gary Bouchard is the founding Executive Director of the Gregory J. Grappone Humanities Institute at Saint Anselm College. He has been an active teacher and scholar at Saint Anselm for more than three decades. During those years he also served terms as the College’s Executive Vice President and as Chair of the English Department. Gary earned his BA in English and Communications at Benedictine College in Atchison, Kansas and his Ph.D. from Loyola University of Chicago. A specialist in the field of 16th and 17th Century poetry, he has published articles on a variety of Early Modern poets and is the author of two scholarly books, Colin’s Campus: Cambridge University and the English Eclogue (2000) and most recently Southwell’s Sphere: The Influence of England’s Secret Poet (St. Augustine’s Press, January 2019). 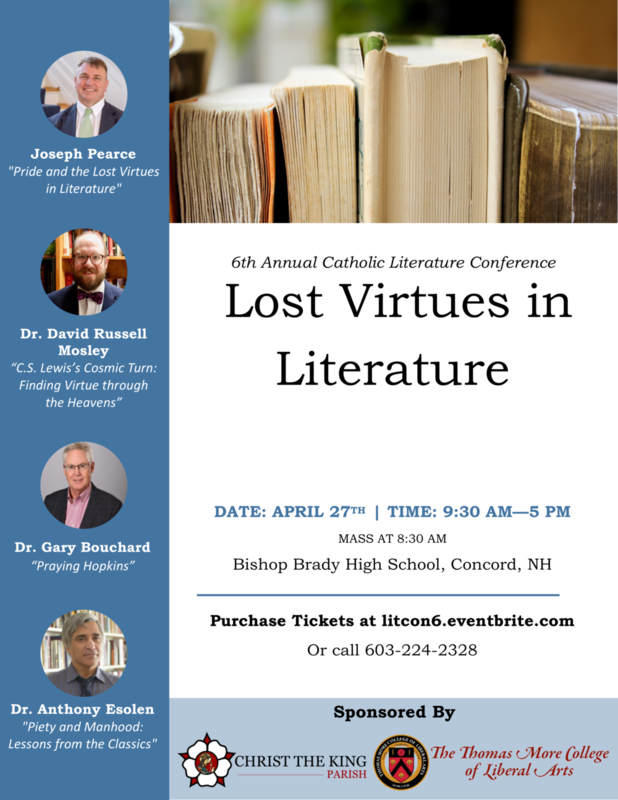 Gary has served on numerous non-profit boards in New Hampshire and is the Consulting Editor and Catholic Press Association award-winning writer for Parable, the magazine of the Catholic Diocese of Manchester. His book Twenty (or so) Poems to Pray is due out from Liturgical Press in 2019. Anthony M. Esolen is a writer, social commentator, translator of classical poetry, and professor of English Renaissance and classical literature. He has taught at Furman University and Providence College, and joined the faculty of Thomas More College of Liberal Arts as a professor in 2017. Esolen has translated into English Dante’s Divine Comedy, Lucretius’ On the Nature of Things, and Torquato Tasso’s Jerusalem Delivered. In addition to multiple books, he is the author of over five hundred articles in such publications as The Modern Age, The Catholic World Report, Chronicles, The Claremont Review of Books, The Public Discourse, First Things, Crisis Magazine, The Catholic Thing, and Touchstone, for which he serves as a senior editor. He is a regular contributor to Magnificat, and has written frequently for a host of other online journals. Dr. David Russell Mosley has a PhD in theology from the University of Nottingham. While there he wrote his dissertation, now a book, Being Deified: Poetry and Fantasy on the Path to God. Dr. Mosley’s combined interests in literature, poetry, and theology led him to write his first novel, On the Edges of Elfland, and to continue his research into poetic ways of knowing and understanding theological truths. Dr. Mosley has a blog on Patheos Catholic called Letters from the Edge of Elfland and has written for several journals and websites. He is husband to his wife Lauren and father to his twin sons, Theodore Nicholas George and Edwyn Arthur Russell Mosley. Dr. Mosley’s research interests are wide-ranging, and he is currently working on a book about reclaiming the theological aspects of medieval cosmology. He also enjoys good craft beer, red wine, single-malt scotch, fine pipe tobacco, and walking through the woods in all kinds of weather. Dr. Mosley serves as the Dean of Humanities at Holy Family Academy where he teaches classes on theology and literature. A native of England, Joseph Pearce is Director of Book Publishing at the Augustine Institute, and editor of the St. Austin Review, editor of Faith & Culture, series editor of the Ignatius Critical Editions, senior instructor with Homeschool Connections, and senior contributor at the Imaginative Conservative. His personal website is jpearce.co. The internationally acclaimed author of many books, which include bestsellers such as The Quest for Shakespeare, Tolkien: Man and Myth, The Unmasking of Oscar Wilde, C. S. Lewis and The Catholic Church, Literary Converts, Wisdom and Innocence: A Life of G.K. Chesterton, Solzhenitsyn: A Soul in Exile and Old Thunder: A Life of Hilaire Belloc, Joseph Pearce is a world-recognized biographer of modern Christian literary figures. His books have been published and translated into Spanish, Portuguese, French, Dutch, Italian, Korean, Mandarin, Croatian and Polish. Pearce has hosted two 13-part television series about Shakespeare on EWTN, and has also written and presented documentaries on EWTN on the Catholicism of The Lord of the Rings and The Hobbit. He has participated and lectured at a wide variety of international and literary events at major colleges and universities in the U.S., Canada, Britain, Europe, Africa and South America. C.S. Lewis, “The Planets”, in the essay “The Alliterative Metre,” Lysistrata 2 (May 1935).